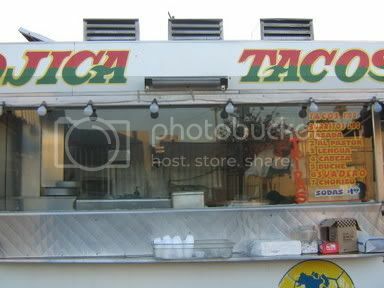 On any given afternoon on the street corners of East Los Angeles you will find the taco wagon. Parked in front of auto repair shops or empty lots the taco wagon is an important cultural fixture on the eastside. It's where day laborers shuffle out of a work trucks, where locals socialize and fritter away the remaining sunlight , where the working man unbuttons his shirt, rolls up his sleeves and holds the taco in his palm that represents more than just the end of the work day. We all come together knowingly or not stewing in this experience. 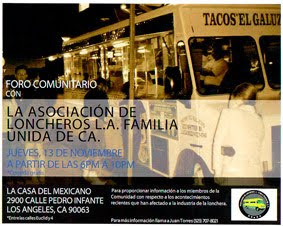 It’s the East LA taco cart where it’s important to act like you’ve been there before. Ordering in spanish helps, just don’t give any indications that you’re a soft westsider. 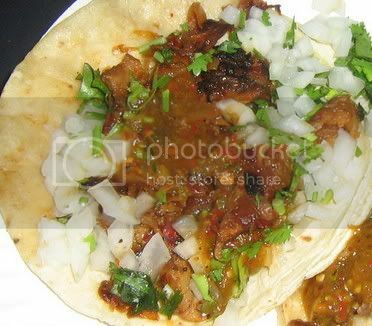 My al pastor and asada tacos greeted me through a slideing glass window and I dressed the tacos with onions, cilantro, and salsa roja from the condiment table. 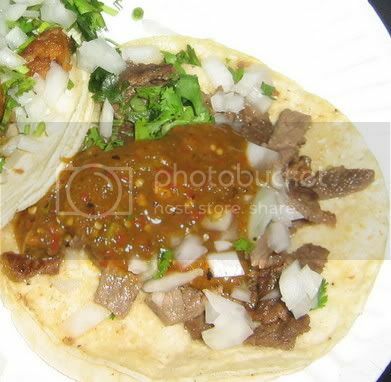 The beef just greasy enough to soften the corn tortillas and the salsa roja with a heavy chile arbol flavor had enough bite to have me scambling for my can of coca cola. Thin slices of charred pork felt right with the carmalzied onions and spicy chile. The heat from the roja caught up to me and I had to sweat the last couple bites out but it was worth it. Eating tacos from street vendors is a way of life in these parts where sitting on the hood of ones car with a plate of tacos and a cold beverage is what makes us Angelenos. We kick back. We kick back and eat tacos. Especially on the eastside. The tacos were pleasing enough to not ruin the moment and that’s all anyone can really ask for. Sometimes it’s the experience not the tacos themselves that make it all worthwhile. I really want to thank you for your great hunt as my husband and i love tacos and visit the places you've reviewed. and your description is awesome too, not too wordy but very descriptive and detailed. thanks! you were a block from Cheo's! Cheo's is (usually)Thurs-Sunday about 6:30 or so until the propane runs out! Love your blog. I've always loved tacos from those "hole in the wall" restaurants. I've been meaning to start a blog about my search for the perfect bowl of menudo. Mojica's was actually Taco Boss at one point. Back then, Cheo's was superior but I can't compare with Mojica's since I have not eaten there. El Paisa on Huntington Drive (near the border of Alhambra) might be the best in El Sereno. Alos, try the tortas at King Torta on Valley and Boca. I agree with "slowrider", Cheo's is WAY better than Mojica's. And now they are even open on Wednesday"s too! And "researchowl", I like the atmosphere at El Paisa (especially when they had the grill made out of an old Datsun Truck Bed), but the carne and chile is better at Cheo's!! I tried Mojica in August 2007. These tacos are pretty darn good. The tortillias are done up real nice and the salsa has got some good flavor. The al pastor comes straight off the spit so that's a bonus right there. The cooks are real nice there too. Check it out if you have the chance. 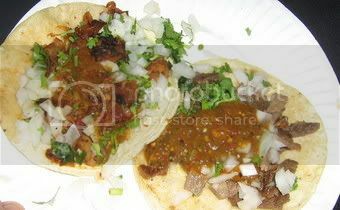 not only because they are my friends but because the taco's are AWESOME...the salsa is good.... the meat is greasy but with alot of flavor. Cheo's is not that great... La golondrina is better..
but nothing compares to the MOJICA! !